Illinois quarterback AJ Bush (1) celebrates while running onto the field at the start of the game against Western Illinois at Memorial Stadium on Saturday, Sept. 8, 2018. As I begin to cover my fourth season of Illinois football, I wanted to try something new. After each Illinois game, I will be sharing what I like to call the Press Box Bundle. Here you can catch up on all the information you might have missed during The Daily Illini sports staff’s coverage of the game. Each week I plan to share my quick in-game observations, a collection of tweets, our video and photo recap, and links to reporters’ stories. Once again, another slow start for Illinois on both ends puts the team down early to Western Illinois. While many thought jitters would be pushed aside, the first quarter still saw plenty. The offense scheme was odd to start. Not a single running back touched the ball until the last play of the quarter. Offensive Coordinator Rod Smith looked like he wanted to get the ball moving through the air but, with no Mike Dudek, Ricky Smalling or Lou Dorsey, it was to no avail. The special teams continue to be a strong spot for Illinois, pinning Western deep several times. The defense began to take a step in the right direction after they figured out the continuous misdirection being used by the Western Illinois offense. However, the spark that Illinois needed was still not lit. Once AJ Bush headed to the sideline with a slight limp at the end of the first quarter, it was time to answer the backup quarterback question. Throughout training camp, the freshman scholarship QBs fought for reps behind AJ Bush and it came down to a close battle between MJ Rivers and Matt Robinson. We found out who won. Rivers headed behind center at the beginning of the second quarter for his first collegiate snap and didn’t let the coaching staff question his decisions. He immediately showed signs of composure, with no hesitation to throw the ball. Drops by his wide receivers prevented substantial downfield movement on his first go-around, but when he came back out for the second time he stayed just as calm and collected. Rivers possesses a lot of the same qualities of grad-transfer AJ Bush. His side-to-side speed and elusive qualities allow for him to keep a play alive, both of which were on display throughout the second quarter. Going into the season, his throwing mechanics were the only question mark as his elbow expands a little too far outwards. However, Rod Smith wasn’t afraid to give him a shot to continue throwing the football, and it led to two strong passes to freshman receiver Edwin Carter. Briefly, it looked like Carter could be the answer to who the next player would be to step up. Unfortunately, Carter took a hard blow to the side on his second touchdown grab, forcing him to flip into the end zone. He walked off with the help of medical staff. The impressive route running by Carter was refreshing in a game with no Smalling or Dudek. Although, what looked like it could be a coming-out party was cut short by a severe injury. MJ Rivers came out with steady hands. The freshman didn’t put together any flashy plays, but he brought the Illini into scoring position to set up a 54-yard and 44-yard Chase McLaughlin field goal. As the third quarter stretched on, the MJ Rivers show took a small commercial break. The special teams unit stepped up again, this time with a punt block by Dawson DeGroot that was scooped up by Stanley Green for the score. For a team that has plenty of ground to make up on their big ten conference colleagues, the special teams unit could serve big in not only setting up the team with good field positions but nailing long field goals and grabbing the occasional score. The special teams unit may be the quiet hero of Illinois’ day, with Blake Hayes locking the Leathernecks deep in their own territory and Chase McLaughlin sinking long field goals for the second game in a row. A strong special teams performance can especially come in handy when a defense struggles to get stops. The secondary with the absence of Nate Hobbs and Bennett Williams showed its face once again and Western added a 49-yard touchdown to the board. Despite the interception by walk-on Michael Marchese that led to a Reggie Corbin touchdown, the secondary still had major troubles. Holes were left wide open for Western receivers, and a position that was once looked at as the deepest on the team now looks like it may be one of the greatest concern. Speaking of position depth, the running back depth looks to be legitimate. When all else fails, the Illini are able to turn to the rushing attack. Mike Epstein and Reggie Corbin both have the ability to make plays that other Illinois players can’t and getting them the football has proven to be a major positive for this team. The offense came into the season with plenty of question marks hovering around, in contrast to the defense who many thought would be the team’s strength. At the beginning of this season, the tables have certainly turned with the suspensions looming large. While neither side of the ball is a standout, the issues on the Illini defense could be giving them the most problems down the road. Mike Epstein put together a great outing with 105 yards on eight carries, helping pace the Illini to a 238-yard rushing day. With now two games in a row where the team has, supposedly, underperformed, the run game has been the only constant. Rod Smith not handing off carries early in this game could have cost the Illini more scoring drives, and head coach Lovie Smith noted in his postgame that the game plan did have to change. Smith stated that he wants to run a balanced offense, and wants to be able to throw the ball in any situation. Although, when a team is missing its two best wide receivers and has a strength at running back, it just feels a bit bizarre. that’s a major positive in my book. The ability to not force a play and look for positive yardage doesn’t come easy, just ask Reggie Corbin who told me earlier this week that his freshman days were full of lost yardage due to him trying to do too much. As for the Illini defense, the return of Nate Hobbs, Tony Adams and Bennett Williams couldn’t come fast enough. The defensive line took a step forward with both Isaiah Gay and Bobby Roundtree noticeable applying more pressure, leading to each getting his first sack of the season. For Illinois to even think about giving USF, its next opponent, a close game, they must confront their issues defending against the passing game. Former Alabama quarterback Blake Barnett will happily be waiting to bump his stats if Hardy Nickerson and defensive backs coach Miles Smith can’t address the wide open holes down the field. 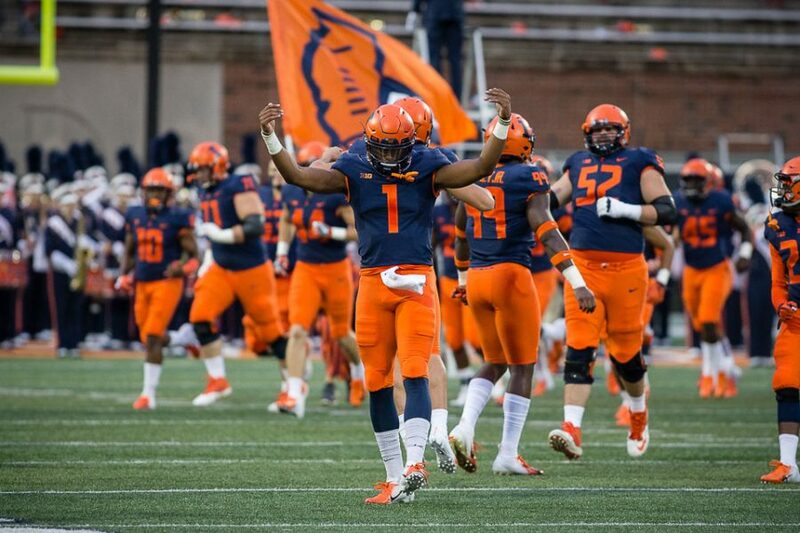 Nevertheless, Illinois grabbed itself a 34-14 victory and the team, as last year, is sitting at 2-0. Plenty can go wrong down the road, but progress was made. The record may be the same as last year at this time, but the situation is very different. Illinois has competent quarterback play, the team has a reliable rushing attack, the special teams continue to make plays and the defense is on its way to getting back its top players. The difference between last year’s and this year’s group is the ability to be trending up. 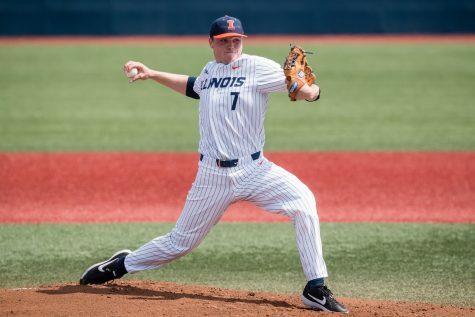 Last season, Illinois went into the season with a bit of false optimism surrounding the program. The quarterback situation plagued the team, and playing more freshmen than any other team in the country was on the agenda. Instead, this season the team has many early season factors working against them, whether it be the suspensions or lingering injuries. But Illinois is on its way to fixing these problems, and at the end of the day, that couldn’t have been said last year. Western drives down the field and scores on a 20 yard TD pass. #Illini defense with another rough start. 12:07 to go in the first. #Illini down 7-0 to FCS opponent Western Illinois… AJ Bush comes out w/ an injury, M.J. Rivers now at QB. 5 plays and 45 yards for the freshman QB. The turnaround happened before halftime for Illinois.